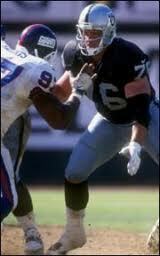 I was shocked yesterday when I heard the news that the once Raider legend Steve Wisniewski decided to resign as the assistant offensive line coach. I was so upset that I couldn’t even comment about it until this morning. Even though Wisniewski was only an assistant offensive line coach, he had a lot to offer to the Raiders and his years of being committed to excellence would have been no doubt a necessary advantage for the Raiders offensive line. I can’t blame Wisniewski for leaving. Coaching in the NFL is extremely brutal. 15 to 17 hour days, 7 days a week can take a toll on anybody; especially somebody that has many positive outside obligations. Wisniewski not only a family man, but is also a minister at the Raiders team Chaplain's Napolean Kaufman's East Bay church. A large portion of NFL teams do not hire assistant offensive line coaches. Therefore, the Raiders will not be signing one for this upcoming season. Offensive line coach Frank Pollack will continue to coach the Raiders offensive line, but having Wisniewski present would’ve helped the Raiders because Wisniewski could've assisted in technique building and schemes. Wisniewski was an eight-time Pro Bowler with the Raiders during his career. He joined the coaching staff last year and remained when new coach Dennis Allen took over.